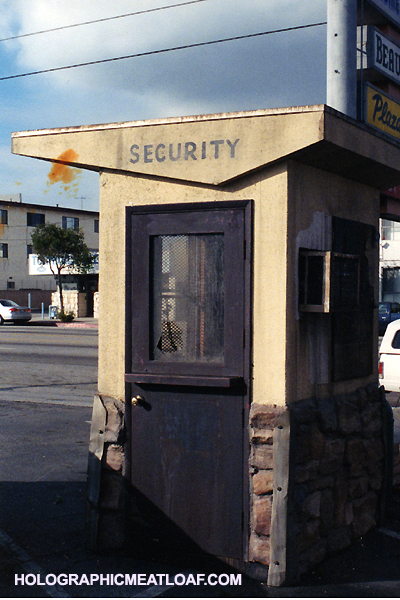 For today’s post, I’m taking a cue from IAMNOTASTALKER, a very cool site with a humorous name that lists movie locations all around southern California. And being I live in said area, I dig what I’ve seen on that site. 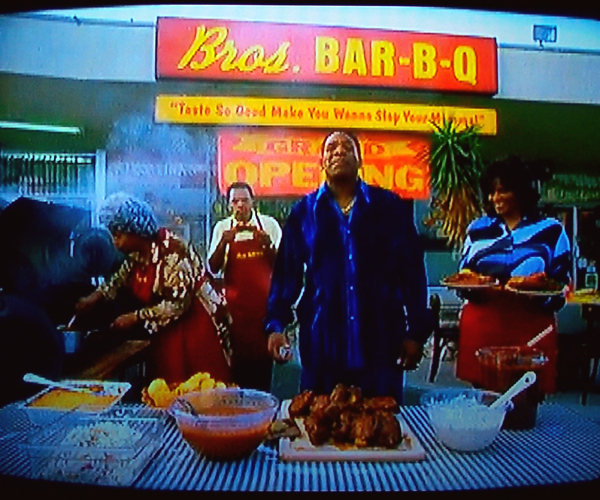 Way back in 2002, I was tipped off by a friend of mine that there was some filming going on at a strip mall down the street from his home and not far from Harbor-UCLA Medical Center, whose main exterior was used in the classic TV show Emergency! 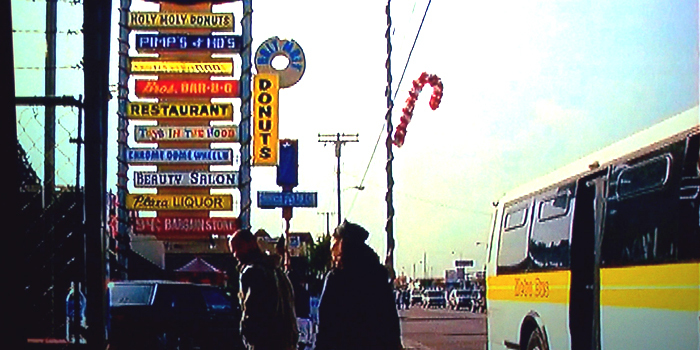 He said he had no idea what it was because they were pretty much done by the time he found out but that I should check out the names of the fictitious businesses in the strip mall. So I grabbed my trusty Minolta X-370 and rolled down there. And boy, was he right. The names were downright hilarious and although I took quite a few shots of the location, the ones that follow are only a portion of what I could find; the rest are scattered amongst boxes of photographs. (I used to work in photo labs most of my life so you can imagine how many pictures I have.) 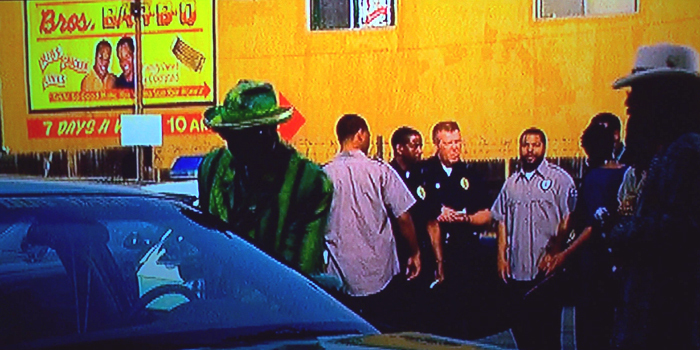 And it wasn’t until I did some serious investigating that I learned the movie being shot was Friday After Next. Don’t ask me how I figured it out; I guess my Google-Fu was strong that day. At any rate, here are my shots along with not-so-comparable shots from the movie, taken directly from my TV screen. As usual, click on the image to embiggen in a new window. And keep in mind that this was being shot during the summer, so you can imagine how confused passers-by may have been when the day’s shooting was over and the mall had Christmas decorations all over it! 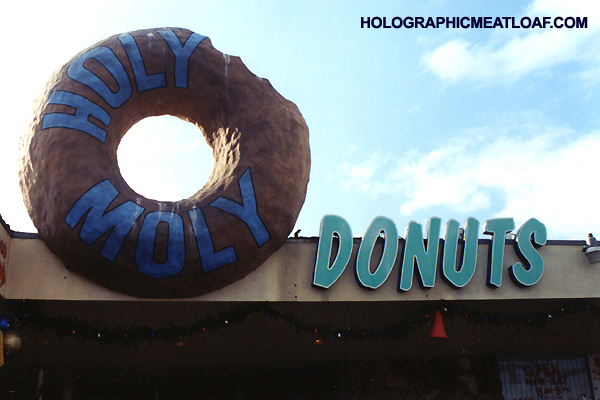 Also, remember that my shots were all scanned from original prints so the quality is definitely lacking. 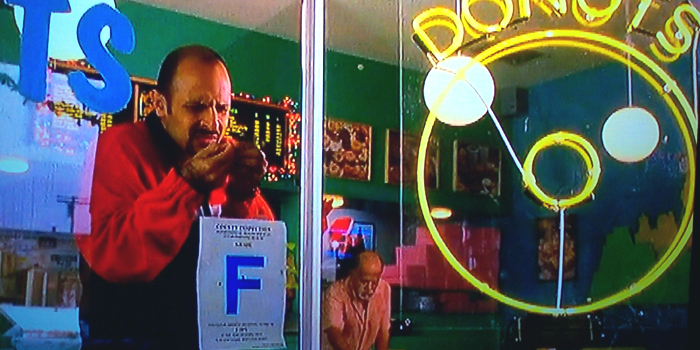 The first is from the movie and includes Holy Moly Donuts’ bogus Restaurant Grade from the L.A. County Health Department. 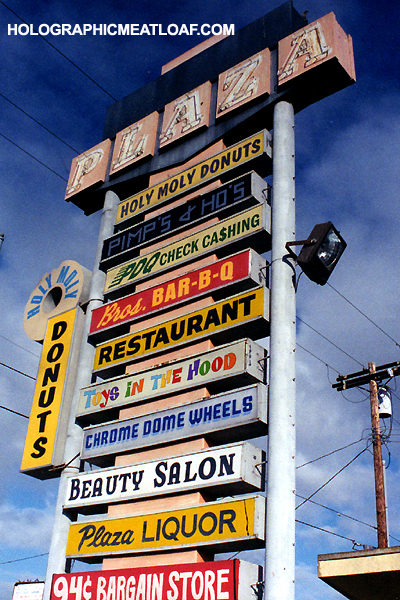 One of my missing shots is a close-up of the sign which reads “FOR GOD’S SAKE, DON’T EAT HERE!” at the bottom. And yes, there were still some flies stuck between the sign and the window. 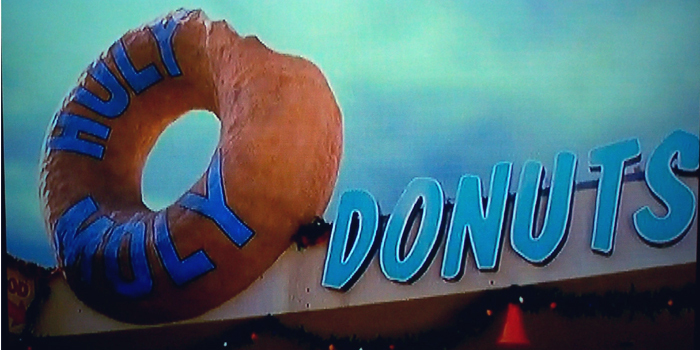 "FOR GOD'S SAKE, DON'T EAT HERE!" It was even more amusing seeing it in person and up close. Seen in the background (and missing all the cool toys in my shot). The Christmas lights had already been removed by the time I got there. And by the way, the booth was just a prop. This was about the only scene in the movie where the sign is almost seen in its entirety; the rest of the time the camera just pans by it. 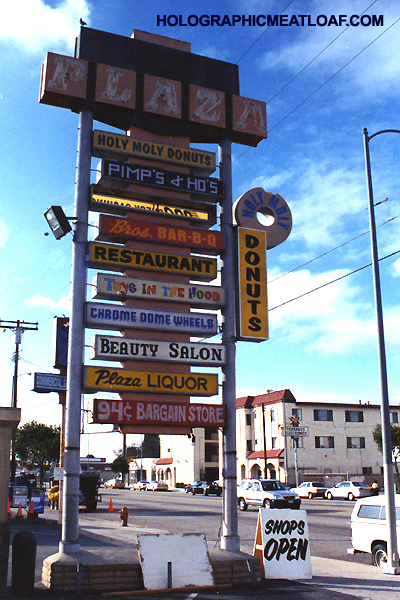 Some of the other missing shots include some of the liquor store which really is a liquor store, the interior of Holy Moly Donuts, and the signs above the “Weave It Alone” and “Pimp’s + Ho’s” storefronts. Naturally, should I find them, I will most definitely post them here. 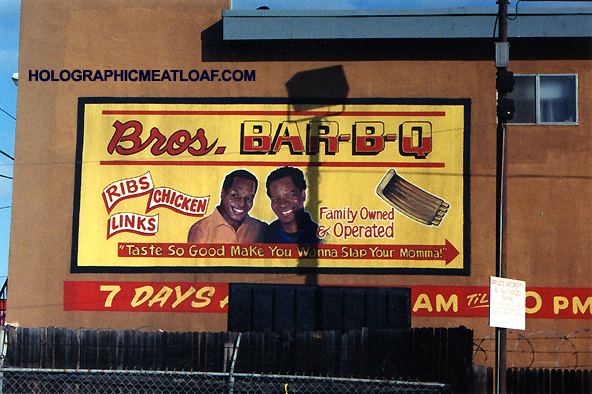 See it yourself: Although the address given in the commercial for Bros. Bar-B-Q is 15837 South Crenshaw, it’s nowhere near that. In fact, here’s that address via Google Maps. Looks nothing like it, huh? 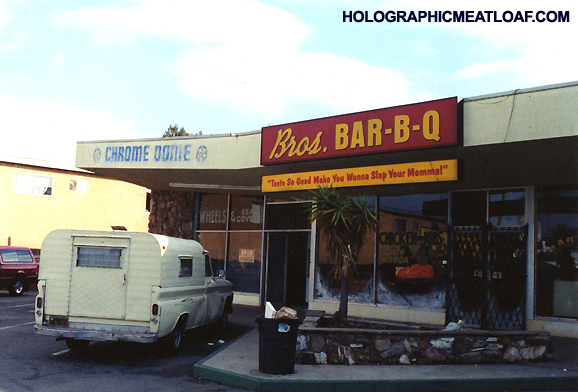 If you want to see where the strip mall really is, you have to head over to 1528 West Carson Street in Torrance, CA. And while you’re out there, check out Harbor-UCLA/Rampart Hospital–it’s right down the street anyhow! Thanks again to Lindsay at IAMNOTASTALKER for inspiring this post! 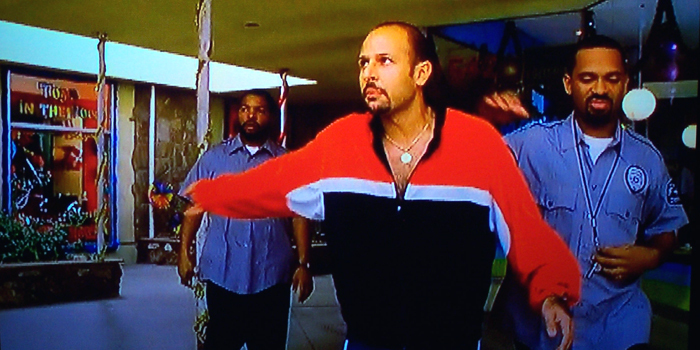 This entry was posted in Entertainment, Filming, Movies, Photography and tagged califorina, Filming, friday after next, ice cube, Movies, torrance by Dave. Bookmark the permalink. How funny is that? And it’s so cool that you have those pictures. I do have more of the pictures.But remember the day we dropped in for the visit was on my bday,which is in November.The reason I recall this is we were going to Sams Club to get pizza for dinner.But they did film for a LONG TIME! Was it November? I thought it came out in November and recall saying something about the Christmas decorations at the time of year it was. Hmmm, dunno then. 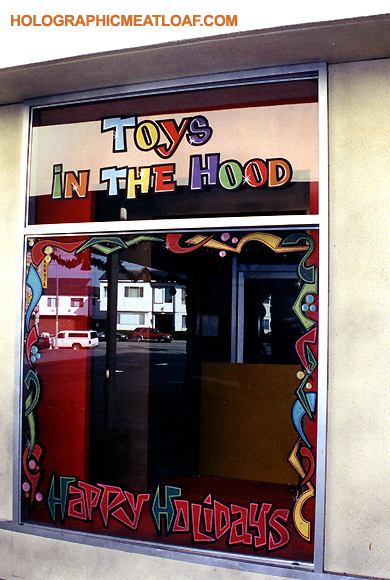 They had to be there a long time–half of the movie takes place there!